No. 1 Stable’s The Boss Factor goes for his second straight score and first stakes crown, in Saturday’s $100,000 Display Stakes, at Woodbine. 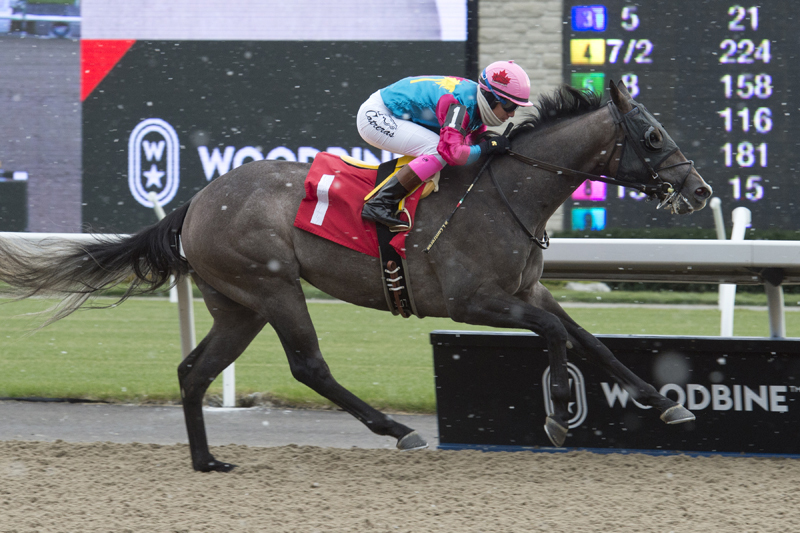 A two-year-old son of The Factor, the grey gelding gallops into the Display in winning fashion via a maiden-breaking triumph at the Toronto oval on November 11, trouncing seven rivals to the tune of a 7 1/2-length romp over seven panels on the Tapeta. Sent off as the 2-1 choice, The Boss Factor was 5 1/2 lengths in charge at the stretch call, widening his advantage with ease down the lane for the impressive victory. Now, the Kentucky-bred will look to go the extra mile in the 1 1/16-mile main track Display. Carroll, who has won the race on three occasions, most recently with Glenville Gardens in 2014, is happy with the progress she’s seen in her talented young charge. Bred by Mike and Pat Freeny, The Boss Factor wasn’t a factor in his career bow on September 23 at Woodbine, in a 6 1/2-furlong race. Bumped sharply by a rival at the top of the stretch, he finished eighth as the second choice on the tote board. In his second start, on October 20, The Boss Factor was bumped again, this time at the outset of the 6-furlong main track event. He was able to recover and went on to finish a solid second to Corduroy Road. Regular rider Luis Contreras will partner The Boss Factor again on Saturday. Contreras has won four editions of the Display (2017, Admiralty Pier; 2014, Glenville Gardens; 2012, Avie’s Quality; 2011, Maritimer). Last year, Admiralty Pier ($6.20, to win) won for owners Bruce Lunsford and Hoolie Racing Stable. First post for Saturday’s 11-race card at Woodbine is 1 p.m. The Display, slated as Race 8, is set for 4:38 p.m. When Thoroughbred racing gets out of the gates tonight, jockey Eurico Rosa da Silva and trainer Norm McKnight will look to add more wins to their respective record-breaking totals. With 223 victories on the season, da Silva eclipsed Mickey Walls’ previous single-season record for Woodbine wins, 221, set in 1991. To date, McKnight has 120 victories in 2018. The previous standard of 119 wins was set in 2011 by Hall of Fame trainer Mark Casse.